A little history...I have owned ferrets, dogs, cats, chinchillas, hamsters, etc throughout my lifetime. My littles (20, 15 and 8) are growing up on me quickly and baby fever kicked in after I lost my 10 year old doberman to auto-immune disease. We fought it for two years and the last attack she gave me "the look" so I took her to the emergency vet to be put to sleep. She is now peacefully resting in her urn in the living room. A friend of mine had a colony of suggies when we were young and I was always intrigued with them. She shared them with me when I would visit and I grew very fond of them. I witnessed the bond and knew enough about them to know I wanted to get a pair. 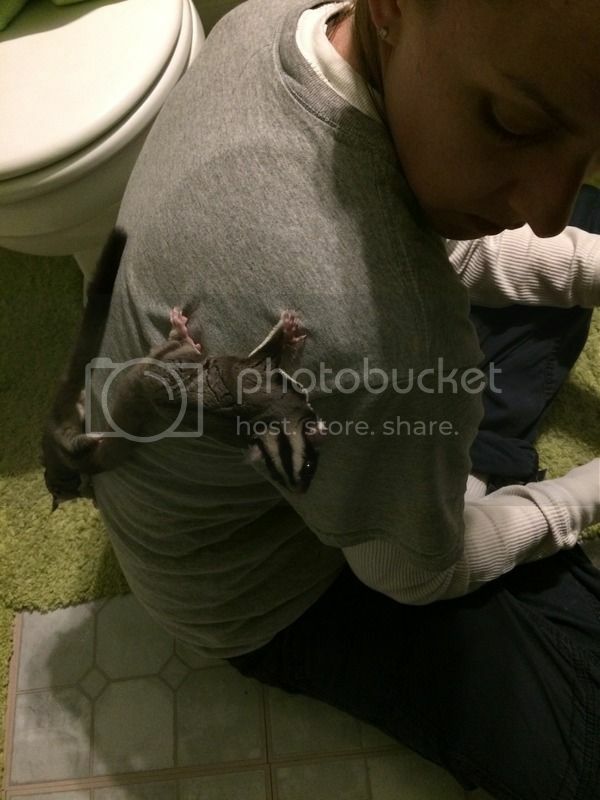 I contacted a breeder and found some lovely young ladies but my wife decided we should rescue instead. I knew this was going to be challenging but we are up to it. We started looking and found two males that were in need of a new home. I asked tons of questions about them, the care they were receiving, etc and knew that these little boys needed a new home ASAP. I picked them up Sunday. 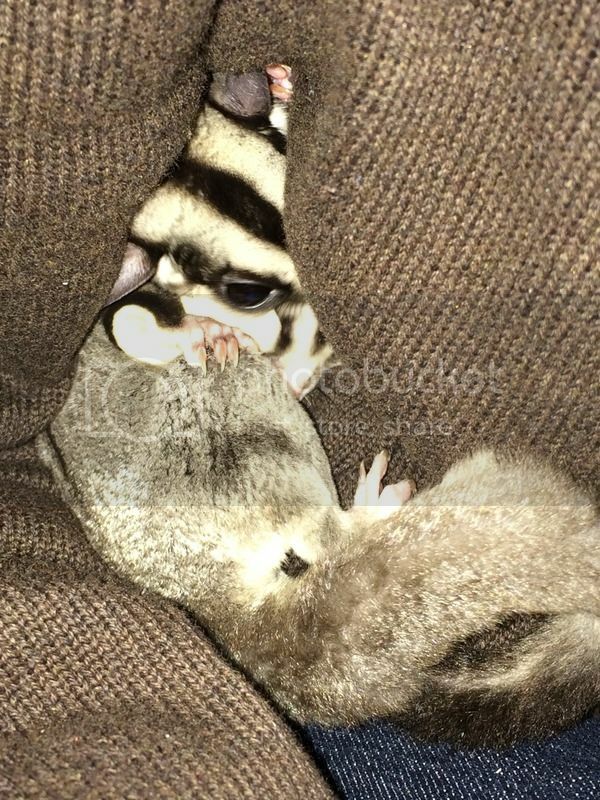 They are 7 months and 8 months out of pouch and came from a "breeder" originally (sounds like someone who is irresponsible and let his pets breed several times to me) and were supposedly put together at a young age. They do seem to be very bonded to each other so no issues there. The family that had them knew nothing about them except what the "breeder" told them and they were feeding them cat food with sunflower seeds and pumpkin seeds mixed in. I have placed them on BML diet and bonding is going really well. They go for their vet check and neuter Saturday morning (the earliest the vet could get us in). The first night we didn't handle them much and let them get used to their new home and our voices. It didn't take long to realize that we def do not have two males. At first we thought it was possible that we had one intact male and one neutered male but after some additional bonding time and closer inspection...we have one male and one female. Keeping fingers crossed that we don't end up with any joeys BUT last night Diesel (male) was extra oily during playtime and Moxy (female) was very timid which is not like her. I'm going to get a temporary cage to separate them after work today because my son called when he got home from school saying Diesel was making weird noises and being a little aggressive to Moxy. I'm really hoping she didn't get pregnant already. Sorry for the novel but wanted to introduce myself. And here is a pic during playtime. Don't worry...the master bath is completely suggie proofed. Are you sure you have a male and female? I'm not sure when sexual maturity starts, but I think they may be there. You could have a neutered and an intact male. In that case you will want to get the intact male neutered. The vet will be able to tell for sure. BML is a good diet. You have my curiosity up. Please keep us posted. 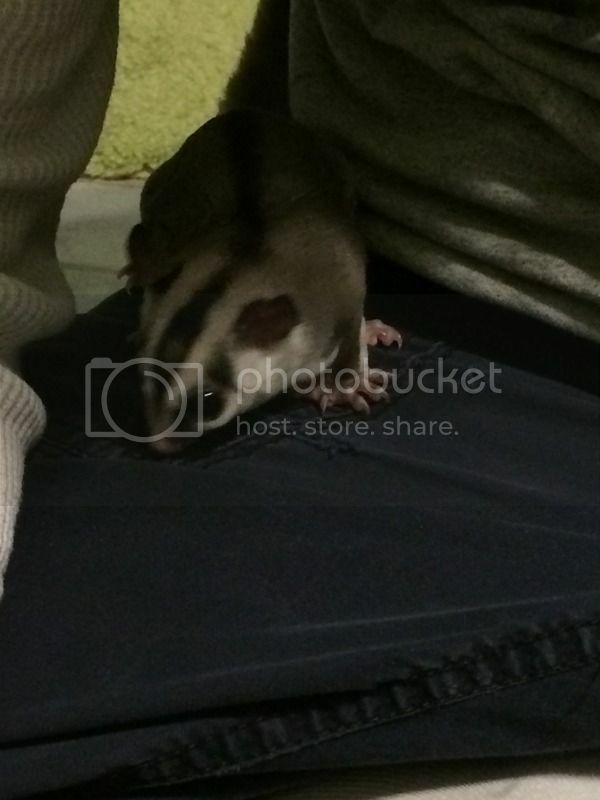 We are pretty sure with the help of my friend and some good bonding so she will let us look for her pouch. 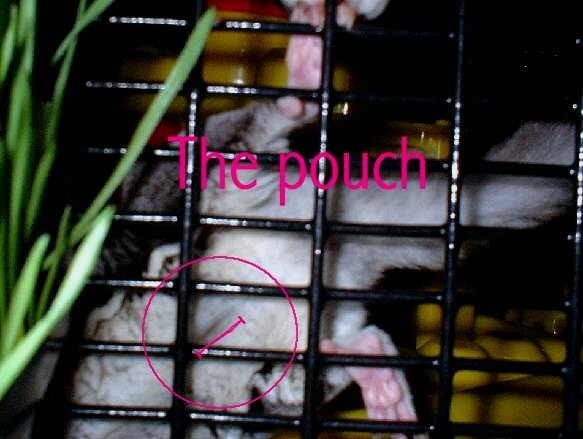 We are patiently waiting for the vet to confirm it but if the "girl" is indeed a neutered male there is what looks like a pouch there. If I can figure out how to post a pic from my phone I will post what we got the other day of what looks like a pouch. Hoping this works. A little hard to see because it's a cell phone pic. Very interested in what you guys think. 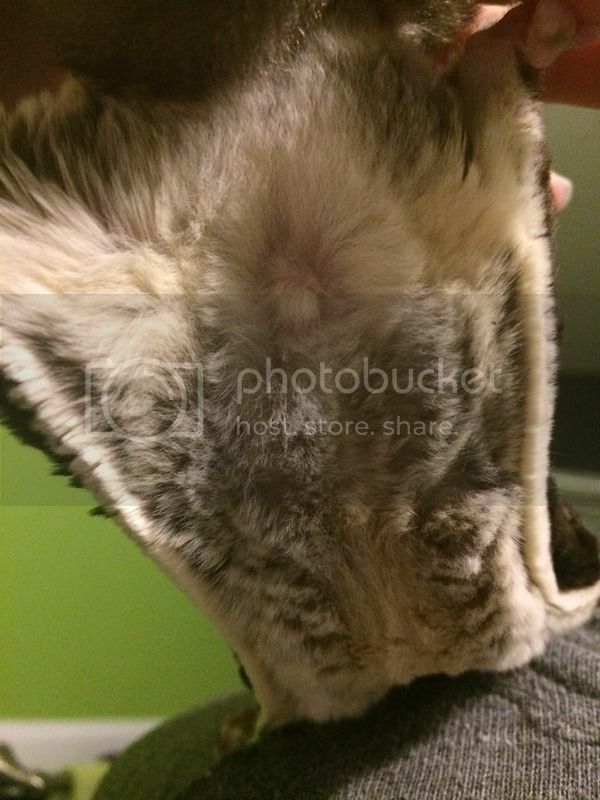 Does it look like a pouch to you or a possible neuter that the pom wasn't removed? 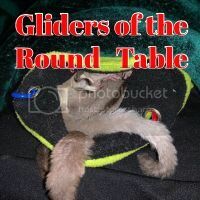 Oh and Saturday they are both scheduled for neutering, vet check, nail trimming, etc but we may be just doing one neuter and hoping we don't have a pregnant rescue glider on our hands because I don't want to breed nor have I ever wanted to breed. 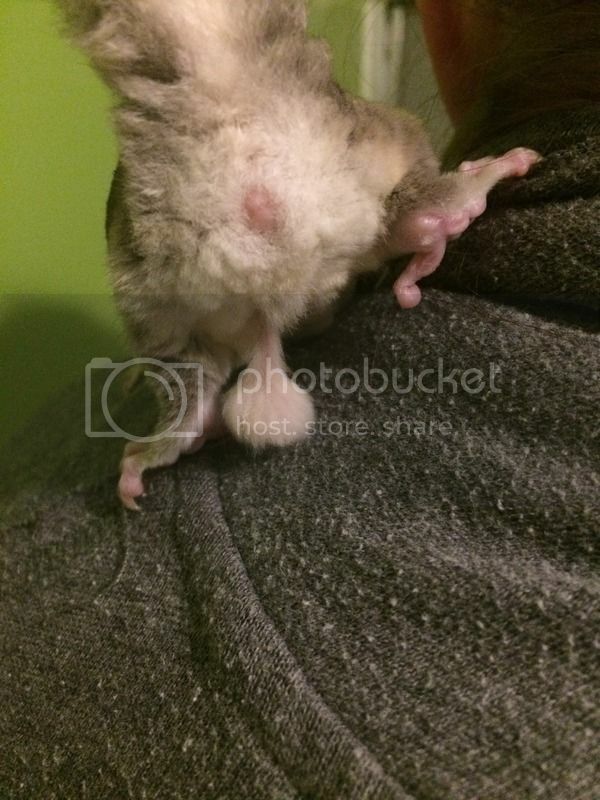 I have heard that they usually eat the first babies if they do get pregnant but not sure how true that is because my friend had all of her males neutered. Maybe someone with better eyes will disagree with me, but that doesn't look like a pouch in the picture; maybe a poor neuter job. 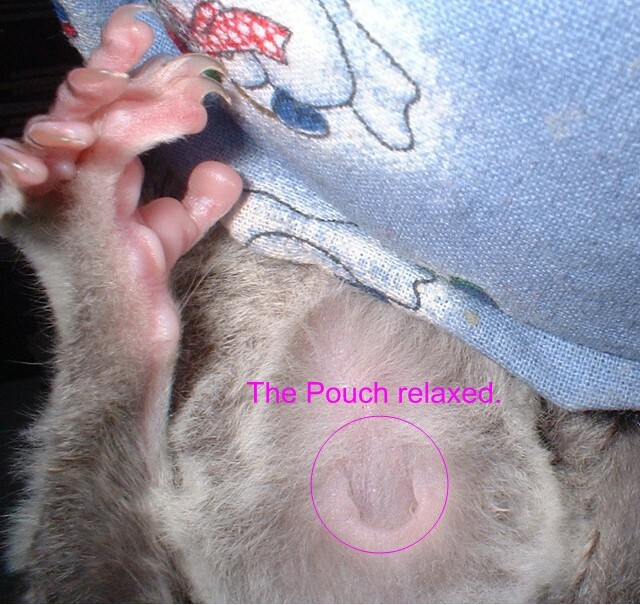 A females pouch looks like a long slit running lengthwise along their belly. Holding the furball the way you are, it would even appear to be opening slightly. At least is would on my two girls. Can't miss it. Leave it to you, Karen, to have a picture for exactly what I spent 10 minutes figuring out how to describe, hahaha!! I will try to get a better picture of her/him in a bit. We have been running around to every store possible trying to find a safe bird cage to separate them. Not an easy task it seems on a Wednesday evening. I am pretty convinced that she is a she now. Playtime tonight Diesel chattered at her a lot, made a weird hissing/bark combo and started biting at her neck while trying to mount her. We got them apart very quickly so no mating occurred but that doesn't mean it hasn't already happened &#128553; I did get another picture of her possible pouch for you guys prior to the attempt to mount her. And a picture of him because we know he is a male. He also has a faint bald spot and she doesn't as you can see here. She is the bigger of the two and we were told she is one month older. Alright the suspense is over...neutered male! Well now both are neutered but not a she. vet said it is possible that Diesel is coming into maturity and showing dominance that appeared to be attempt at mating since they are a bonded pair. Health is good, teeth look great and because he uses laser to neuter they can be in the same cage with no issues. He said he has never seen one mess with the incision enough to irritate it and it is less stressful for them to stay together. He has pain meds every 12 hours for the next three days. Moxy is 92 grams and Diesel is 90 grams. I had my suspicions. Glad everything is good, and they can stay together after surgery. That is always the best way to go. I know you are relieved. Super relieved to know we aren't going to end up with joeys and that they are healthy even though they were not getting the care they needed before coming to live with us. Now back to making cage sets so they can be swapped out regularly. Lucky for these babies I love to sew. Two sleeping pouches and two bonding pouches down...lots more fun fleece patterns to go.